The United Nations headquarters in New York City (wikimedia.commons). United Nations Secretary General António Guterres called on global leaders to ramp up their Paris Accord commitments and to do it soon in a speech he gave September 10 at the U.N. headquarters in New York. “If we do not change course by 2020, we risk missing the point where we can avoid runaway climate change, with disastrous consequences for people and all the natural systems that sustain us,” he said, as quoted in Al Jazeera. Guterres pointed to record-breaking temperatures and devastating natural disasters like Hurricane Maria as evidence that climate change is outpacing human efforts to reduce it. He called on leaders outside of national government, like industry leaders and local officials, to take initiative as well. The U.N Paris Accord, signed by almost 200 countries, aims to keep global temperatures at least 2 degrees Celsius below a pre-industrial baseline by the end of the century. 2020. As of right now, many countries are not on track to meet these targets. Even if the Accord met its full potential, many critics argue the reductions it outlines would not actually meet the 2 degree mark. The next U.N climate summit, COP24, will be held in Poland this December. At this summit, world leaders who have heeded Guterres’ warning will have the opportunity to announce plans to increase their fossil fuel emission reduction targets. The Linn County Board of Supervisors voted unanimously on Monday to remain committed to the Paris Climate Accord, despite President Trump’s withdrawal at the federal level. Iowa City, Johnson County, Des Moines and Fairfield are also members of the coalition. Following the board’s decision, businesses, local organizations and local leaders spoke during a news conference. Linn County Supervisor Stacey Walker said, “Leadership on the tough issues can originate at the local level. One community can make a difference, this is our hope here today,” according to a report from The Gazette. More than 1,200 United States governors, mayors, businesses, investors, and colleges and universities released a statement yesterday titled “We Are Still In,” declaring their continued support of the Paris Climate Agreement. The businesses and investors speaking out for climate action include 20 Fortune 500 companies that generate $1.4 trillion in revenue annually. Participating city and state leaders collectively represent 120 million Americans ranging from New York City Mayor Bill De Blasio to Palo Alto Mayor Greg Scarff. Des Moines Mayor Frank Cownie and Dubuque Mayor Roy D. Buol are among the signatories. Cownie said in a written statement, “The recent action by the White House to withdraw from the Paris Agreement does not stop Des Moines’ efforts in advancing our own efforts on climate change. Cities like Des Moines will continue to work to make our communities more sustainable places to live.” Other statement endorsers from Iowa include state Attorney General Tom Miller; J. Bruce Harreld, president of the University of Iowa; Raynard Kington, president of Grinnell College; Paula Carlson, president of Luther College. Cownie is in good company. Since the White House withdrew from the Paris Agreement, 17 governors have released statements in support of the accord, 13 governors formed the U.S. Climate Alliance and 211 mayors have independently taken on the climate action goals outlined in the Paris Agreement for their communities. Below, CGRER co-director Jerry Scnhoor interviews Mayor Cownie at COP21 in 2015. “President Donald Trump expects to withdraw the U.S. from the Paris Climate Agreement this week. It is a sad time for U.S. leadership in the world. We should remain in the Agreement that we faithfully signed for important environmental, political, and economic reasons. Climate change is already here – even in Iowa – and it is going to get much worse if we do not reduce our greenhouse gas emissions that are accumulating in the atmosphere and heating the planet. 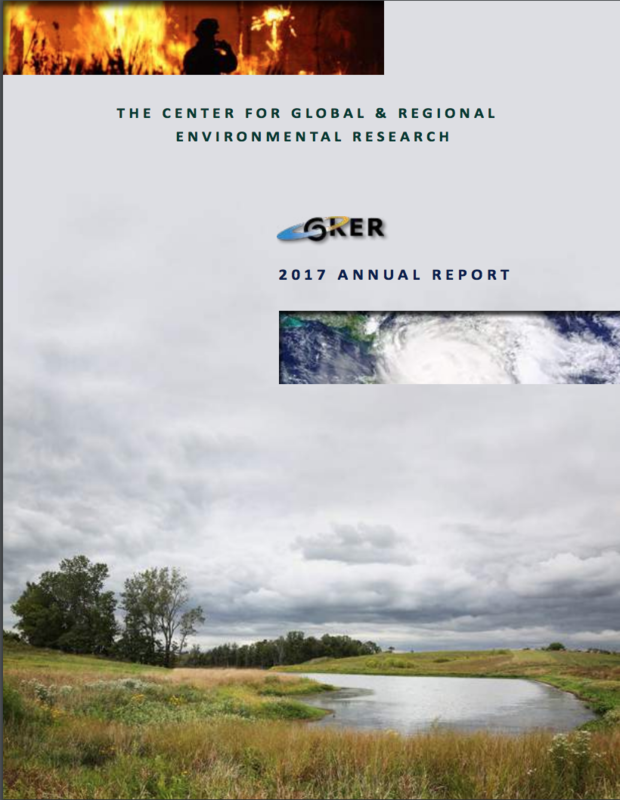 We recognize climate change in the Cedar Rapids flood of 2008, from which we are still recovering, and the (extremely unusual) Cedar River Basin flood of September last year. Temperatures are warmer, especially at night and in the winter. Intense precipitation is more severe and frequent. 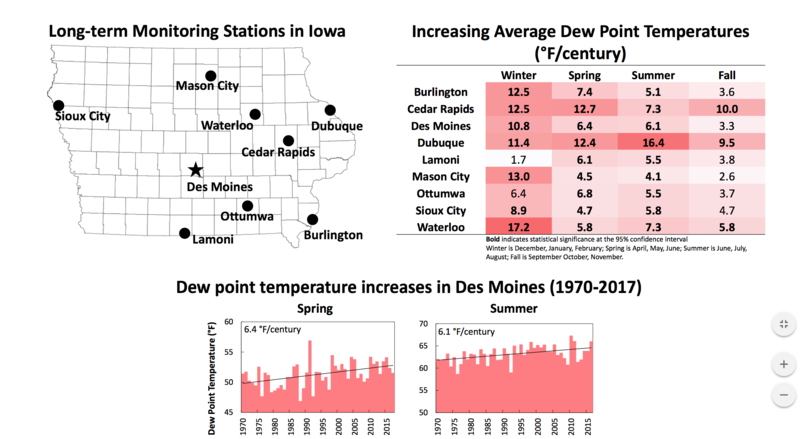 It is a wetter/warmer Iowa with more humidity in the air and greater runoff in our rivers. At the global scale, ice is breaking and melting – in the Arctic, Greenland, Antarctica and land-based continental glaciers everywhere. Animals, which depend on the ice for fishing and hunting, like polar bears, are in trouble. Oceans are 30% more acidic than 50 years ago due to carbon dioxide from burning fossil fuels, subsequently bleaching coral reefs and undermining fisheries. More frequent droughts and floods affect agriculture and food supplies. Sea level is rising and already influencing real estate prices and the number of days with “clear sky” flooding in the streets in Miami. Impacts on human health, heat stroke, air quality, pollen, emphysema and asthma, and the migration of mosquitoes and ticks as vectors of disease are especially worrisome. Politically, the U.S. is losing its credibility in the world as a stable partner whether one speaks of the Paris Climate Agreement, NAFTA, the Trans-Pacific Partnership, or NATO. Once broken, trust is hard to restore. America First means everyone else be damned, and friends can be difficult to find in times of need. Moral and ethical reasons would dictate that the richest country, which dumped more greenhouse gases into the atmosphere than any other nation, should be the first to act. I stood in Paris with representatives from the most vulnerable nations like the Marshall Islands, Kiribati, and the Maldives, who are already losing whole islands to sea level rise and abandoning ancestral homes. I listened in Paris to coastal nations like Bangladesh, Senegal, Mozambique, and the Philippines, embattled by improbable storm surge and increasingly powerful storms. And my heart cries for the children of drought and famine in South Sudan, Somalia, and Ethiopia. These vulnerable countries profited the least from the fossil fuel age, but they suffer the most. It is not often when 194 countries agree on anything. What makes the Paris Climate Agreement unique is that for the first time, nearly every nation (rich and poor alike) agreed on an equitable “bottom-up” plan to decrease emissions and to fund the most vulnerable nations. It is certainly not a perfect agreement, and it does not go far enough to stem the tide of climate change. More will be needed. Jerry Schnoor is Professor of Environmental Engineering and Co-Director of the Center for Global and Regional Environmental Research at the University of Iowa. He attended the Paris Climate Convention in December 2015 as an official member of the media. Fourteen attorneys general sent a letter to President Trump on Tuesday urging him not to withdraw from the Paris Climate Agreement. The United States agreed to the Paris accord along with 200 other nations during the Conference of the Parties 21 (COP21) in 2015. Each country that signed on agreed to take some action to improve environmental conditions, mostly by reducing fossil fuel emissions that cause climate change. For its part, the U.S. pledged to bring its emission levels 26 percent and 28 percent below 2005 levels before 2050. Trump Administration officials will meet today to discuss whether the U.S. should leave the Paris Agreement or stay the course. President Trump pledged to “cancel” the agreement during his campaign, but some of his top officials like Secretary of State Rex Tillerson are in support of the accord.